Bertil Lintner reviews memoirs of activism, incarceration and exile by two renowned Burmese dissidents from different generations. “Prisoner of Conscience: My Steps through Insein” by Ma Thida. Silkworm Books, Chiang Mai, 2016. 248 pages. 625 baht. 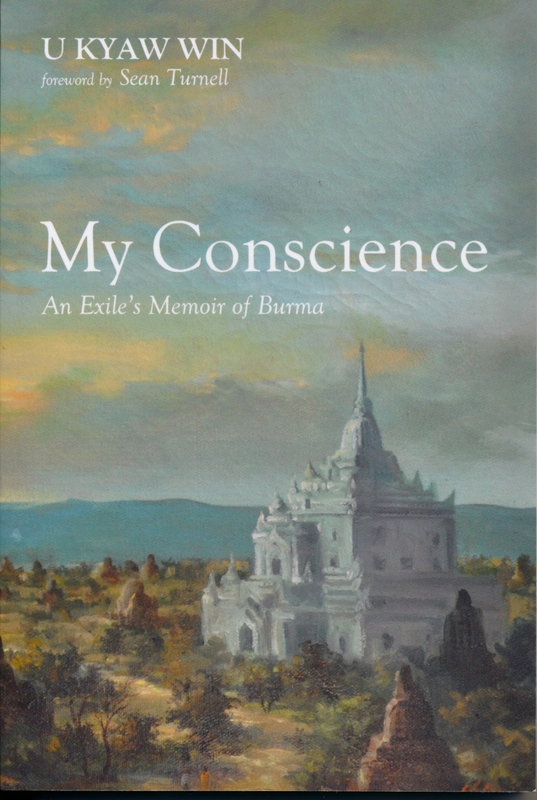 “My Conscience: An Exile’s Memoir of Burma” by U Kyaw Win. Resource Publications, Eugene, Oregon. 254 pages. US$24. In times like these, when Burma is undergoing major changes, there is no shortage of essay collections in which Western academics and other observers try to make sense of a seemingly bewildering situation. But the quality of those writings varies and few, if any, reflect the views and sentiments of the Burmese themselves. It is therefore refreshing to read these two books, one written by a prominent Burmese author, born and raised when General Ne Win and his Burma Socialist Program Party were in power—and who spent the years 1989 to 2008 in prison for her political beliefs—and the other by an older Burmese exile who for many years was instrumental in organizing resistance abroad against the dictatorship. Ma Thida was still at medical school when, in 1988, the people had had enough of decades of repression, misrule and economic decline. She gives a vivid account of how the protests began and developed into a nationwide mass movement against the regime, and how the military opened fire not only at demonstrators but also at a crowd of doctors and nurses. The medical student Ma Thida, who from an early age had been interested in writing, became an accomplished columnist at this time, contributing to the free journals that sprung up during the August-September 1988 pro-democracy uprising. She also joined the National League for Democracy (NLD), traveling around the country with its leader, Aung San Suu Kyi, and made friends with one of the most prominent members of the party, the veteran journalist and writer Win Tin. She could not “help overhearing the vulgar words from trustees who had been put in charge—such as the wealthier drug dealers” and she noted that privileges could be obtained by bribing the guards. She contracted tuberculosis while incarcerated in Rangoon’s notorious Insein Jail. What kept her in reasonably good spirits was her belief in Buddhism, and being able to practice Vipassana meditation in her cell. In 1996, Ma Thida was also awarded the Reebok Human Rights Award and the PEN/Barbara Goldsmith Freedom to Write Award. Three years later, she was released because of her ill health, and due to pressure from PEN International and Amnesty International. Her prison memoir “Sanchaung, Insein, Harvard” was published in Burmese in 2012, the title alluding to the Rangoon township where she was born, then her time in prison, and the time from 2008 to 2010 when she was a fellow at Harvard University in the US. “Prisoner of Conscience” is an English translation of that book, and includes a forward by the late Win Tin, the literary icon who passed away in 2014. Today, Ma Thida is the chairperson of PEN Myanmar, and has received more awards. On September 28, the Vaclav Havel Library Foundation will honor her at a ceremony at the Bohemian National Hall in New York. In the end, it is she—rather than the generals who imprisoned her—that has emerged as a role model for the people of her country. Kyaw Win recalls his upbringing, during which he attended a Christian school—not uncommon in Burma in those days, regardless of the religions faith of one’s parents. He lived through the Japanese occupation and, in the 1950s, went to school in Mussoorie in India, and later at universities in the US. While in the US, he married Riri, an Indonesian lady who became his companion for life. Kyaw Win’s parents kept him up to date with events in Burma and, in 1969, he met in California the deposed prime minister U Nu and Edward Law-Yone, the exiled former editor of “The Nation” newspaper—two key figures in the resistance to Burma’s new military government. In 1973, as Burma grew increasingly repressive, Kyaw Win began writing and editing an eight-page quarterly newsletter, the “Burma Bulletin,” one of the first of many publications by Burmese exiles. In 1975, he took part in the first demonstration in Washington DC against the Burmese military. In 1983, he was among the founders of the Committee for the Restoration of Democracy in Burma (CRDB). Alliances were formed with ethnic rebel armies based along the Thai-Burmese border and, when the uprising broke out in 1988, the CRDB was one of the groups that linked up with the students and other pro-democracy activists who had fled to the border areas after the massacres in Rangoon and elsewhere, when the military stepped in to reassert power. Kyaw Win gives a detailed, firsthand account of what was happening on the border at that time: the intrigues, the dashed hopes, and the personal conviction that kept him going through all the setbacks. Ma Thida probably knows more about suffering than most, but she and people of her generation and those even younger have indeed taken up the mantle. Read together, these two books give a better perspective on modern Burma than any academic thesis or essay ever could.